Almost every industry—from technological companies, telephone line companies, and even publishing houses—requires the presence of customer representatives in order to ensure that their existing and/or potential customers are satisfied with the company’s services/products. 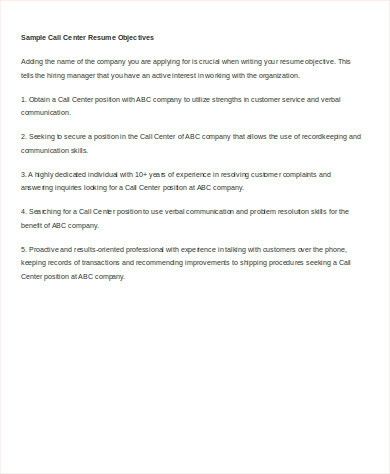 If you are applying for a customer service representative position, then you need to make sure that you include an objective section in your resume. 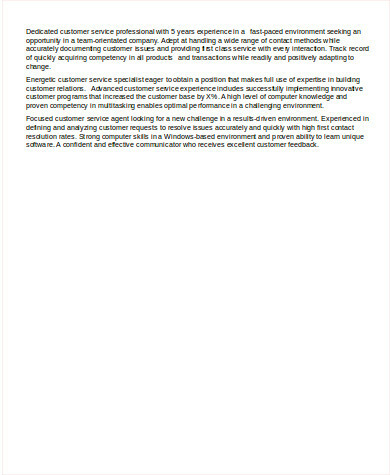 This section allows your prospective recruiter to evaluate your qualifications at first glance. 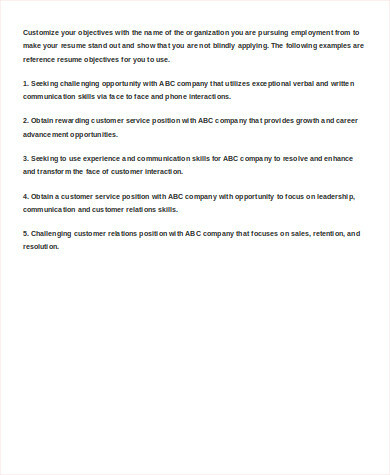 Hence, in order to help you capture your recruiter’s attention, here are some customer service representative Sample Objectives for you to choose from. Simply scroll down below and download the template that suits your needs. Before you delve into crafting your stellar and compelling resume, you need to assess yourself first whether or not you possess enough knowledge about the job position you are applying for. dealing with customer’s complaints either by rerouting them to another relevant department or by giving them an immediate solution to their problems/complaints. 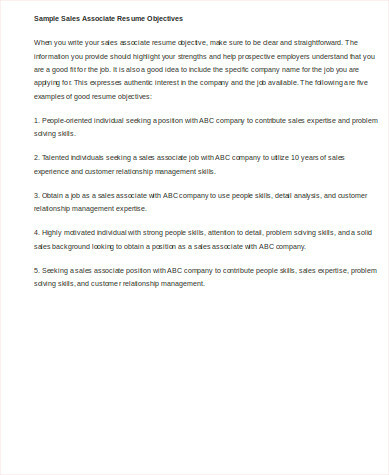 Before you go through the whole process of job application, you need to craft first a resume that will stand out because let’s face it, recruiters/hiring managers are often busybodies who rarely have the time or the patience to go through entire resumes in order to screen potential employees. In practice, these recruiters would merely scan a resume quickly. 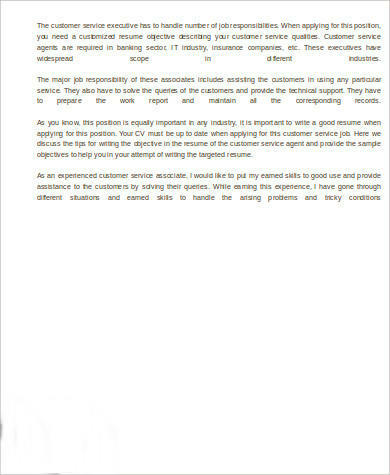 That is why in order to prevent your resume from being discarded, it is important that you include an objective statement on the topmost part of your resume. This way, the hiring manager can immediately assess whether or not your career objectives align with their company’s nature, vision, and goals. 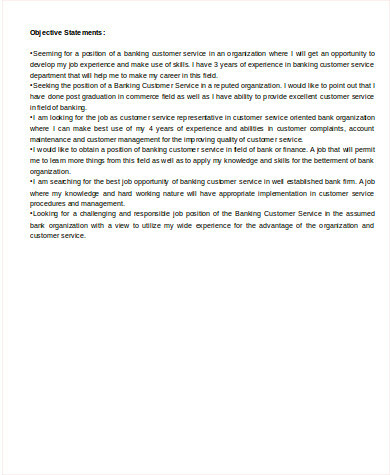 For more reference, we have Resume Summary Examples that are also available for download. A resume objective is a statement of your goals for employment as well as your salient qualifications. 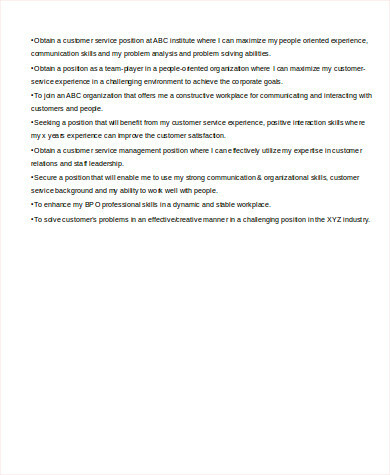 This is usually located at the first and topmost section of a resume. While statement of a resume objective is optional, this may play a huge part in convincing the hiring manager regarding one’s qualifications. This section usually consists of 2–3 sentences. 1. Don’t make long and overly complex statements. 2. Don’t make it all about you. The common mistake job applicants usually commit is by rambling on and on about how being in the company can nourish their career instead of vice versa. 3. Don’t make a cookie-cutter objective. Make sure you tailor-fit your objective statement to the specific job position you are applying for and the specific company you are applying to. 4. Emphasize how you aim to add value to the company’s goals or visions. 5. Make sure it does not exceed 3 sentences.